Conflict with customers, particularly over broken promises or missed payments, is unavoidable. No matter how great your customer service, employee relations, prices, or services are, it’s inevitable: Someone will be dissatisfied — and tempers may even flare. Instead of avoiding conflict, you and your staff members can use effective conflict resolution skills to help resolve issues and smooth over situations — whether you’re dealing with delinquent invoices, handling credit issues, or even maintaining peace at home. Conflict arises in credit management situations when you have to deny someone credit or collect overdue payments. It can also occur if you’re suspicious of fraud and someone resents the extra steps you take to verify legitimate transactions. The first step toward effectively managing these and other conflicts is recognizing what causes them. Emotions and defensive behavior can mask several things. However, most conflicts boil down to misinformation, self-esteem, or ego and feelings of being ignored. 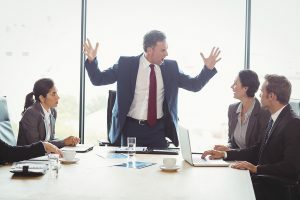 Staying calm and not taking others’ reactions personally can help avoid situation escalations.1 Also, you can use great methods to defuse conflicts — and even avoid them. Improving communication long before any possible misunderstandings can arise is critical to avoiding conflicts. Establish firm, friendly, and easily understandable credit policies and procedures. Make them readily accessible, and share them with everyone on your staff as well as with clients. This can help you avoid misunderstandings about changes, interest accrued, your return policy, and other topics that can spark conflict. When interacting in situations that may escalate, your staff members need to show they value others’ time, opinions, business, and perspectives. This is where active listening skills come in. Taking the time to hear the other person without interrupting and then reiterating what he or she said shows respect and professionalism.2 Then, work with the customer, vendor, or employee to come up with options that might resolve the situation with minimal unpleasantness. Finally, to close the communication loop, it’s a good idea to put what you agreed on in writing to further validate and establish a record. If a situation does escalate into a conflict, the CARS Method is an effective tool to calm upset people, redirect their energies, and work toward solutions.3 CARS is an acronym, standing for the four main steps: connecting, analyzing, responding and setting limits. Connecting involves listening closely and responding with statements showing empathy, attention, and respect. Examples include acknowledging how upsetting the situation is for the other person, showing interest in his or her concerns, and recognizing his or her efforts. This validation can quell hot emotions. Analyzing options involves discussing a list of possible solutions to the problem the other person has voiced. Responding calmly and correcting any misinformation can be the most difficult for people who need to avoid getting defensive. Keeping your response brief, informative, friendly, and firm can make a big difference. Setting limits involves reviewing applicable policies or procedures and discussing consequences if the other person doesn’t follow them, such as not paying by the agreed-upon date. When dealing with money and other sensitive topics, conflicts regularly arise. Make sure you and your staff don’t take it personally; instead, drive CARS toward resolutions. You may want to consider working with professionals who deal with similar problems regularly to elevate your staff members’ skills for dealing with difficult situations. The experts at Mountain States Commercial Credit Management can help you improve your credit management communications. We regularly deal with credit and collections issues and help others improve their processes. Contact us at 800-457-8244 or send a request through our website to learn more about ways we can help. 1 Segal, Jeanne, and Melinda Smith. 2016. “Conflict Resolution Skills.” Helpguide.org. Accessed March 13, 2017. Source. 2 Davey, Linda. 2016. “When an Argument Gets Too Heated, Here’s What to Say.” Harvard Business Review, March 3. Source. 3 Eddy, Bill, and L. Georgi DiStefano. 2015. “The CARS Method for Resolving High-Conflict Situations.” High Conflict Institute. Source. This entry was posted on Monday, May 1st, 2017 at 4:03 pm	and is filed under Blog Posts. You can follow any responses to this entry through the RSS 2.0 feed. Both comments and pings are currently closed.